Friday, the 3d of November, 1654. ORDERED, That Mr. Bedingfield, a Member of this House, have Leave to go into the Country. Ordered, That the Act for ejecting scandalous Ministers be reported on Monday next. The humble Petition of Wm. Lord Craven was this Day read. Ordered, That the said Petition be referred to a Committee, to examine the Matters therein contained; and to call all Parties concerned before them; and to hear them therein; and to state the same; and report their Opinion to the House; Viz. Sir Richard Lucy, Major Long, Mr. Lechmere, Mr. Ash, Lord Lambert, Sir Anth. Ashley Cooper, Colonel Shuttleworth, Colonel Mildmay, Mr. Jenkinson, Mr. Sam. Disbrow, Lord Commissioner Widdrington, Mr. Pitt, Mr. Turnor, Mr. Bond, Colonel Jones, Mr. Parker, Mr. Aldworth, Colonel Whetham, Colonel Mackworth, Mr. Sicklemore, Mr. * Lister, Mr. Oxenden, Mr. Francis Bacon, Mr. Nath. Bacon, Mr. John Smyth, Mr. Gewen, Lieutenant Colonel Worsley, Colonel Birch, Colonel Goff, Mr. Solicitor, Colonel Lilburne, Mr. Wingate, Colonel Shapcote, Alderman Gibbes, Mr. Brewster, Colonel Ireland, Mr. Drake, Alderman Foot, Mr. Wood of Surry, Mr. Bois, Mr. Bond, Colonel Zanchy, Mr. Strickland, Mr. Winn, Sir Wm. Strickland, Commissary General Whaley, Major Gibbon, Mr. Recorder, Colonel Rous, Mr. John Gorges, Mr. Foxwist, Mr. Barkley, Mr. Lilburn, Mr. Peckham, Colonel Bright, Mr. Barnard, Lord Broghill, Colonel Jephson, Colonel Madrin, Mr. Thomas Gorge, Sir Gilbert Pickering, Mr. Bish, Mr. Geely, Mr. Richard Jones, Mr. Pury, Mr. Williams, Sir Rich. Onslow, Colonel Mathewes, Earl Linlithgow, Lord Evers, Mr. Long, Mr. Minors, Mr. Standish, Sir Henry Vane, Lord Commissioner Whitelock, Mr. Anth. Smyth, Earl of Stamford, Sir Wm. Doyly, Sir John Hobart, Mr. Hobart, Colonel Wood or Norfolk, Mr. Wood: To meet on Monday Afternoon, in the Outer Court of Wards: With Power to send for Persons, Papers, and Witnesses. The humble Petition of Sir John Stowell was this Day read. The humble Petition of several Purchasers of the Estate of Sir John Stowell was this Day read. 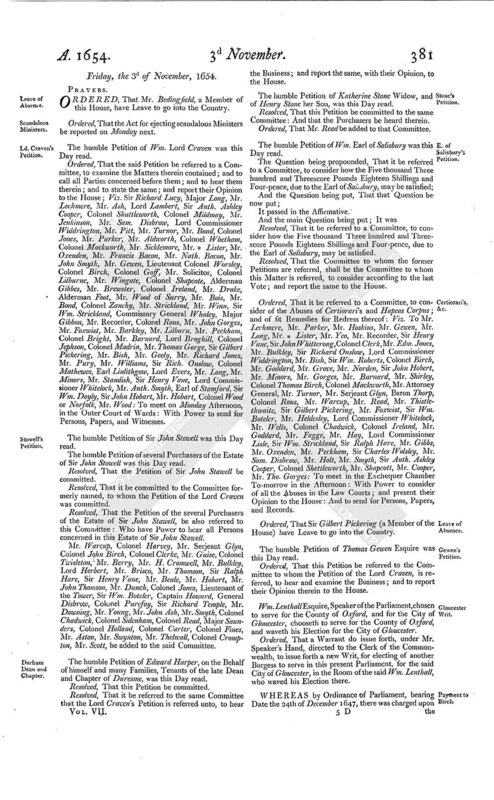 Resolved, That the Petition of Sir John Stawell be committed. Resolved, That it be committed to the Committee formerly named, to whom the Petition of the Lord Craven was committed. Resolved, That the Petition of the several Purchasers of the Estate of Sir John Stawell, be also referred to this Committee: Who have Power to hear all Persons concerned in this Estate of Sir John Stawell. Mr. Warcup, Colonel Harvey, Mr. Serjeant Glyn, Colonel John Birch, Colonel Clerke, Mr. Guise, Colonel Twisleton, Mr. Berry, Mr. H. Cromwell, Mr. Bulkley, Lord Herbert, Mr. Brisco, Mr. Thomson, Sir Ralph Hare, Sir Henry Vane, Mr. Beale, Mr. Hobart, Mr. John Thomson, Mr. Dunch, Colonel Jones, Lieutenant of the Tower, Sir Wm. Boteler, Captain Howard, General Disbrow, Colonel Purefoy, Sir Richard Temple, Mr. Downing, Mr. Young, Mr. John Ash, Mr. Smyth, Colonel Chadwick, Colonel Sidenham, Colonel Read, Major Saunders, Colonel Holland, Colonel Carter, Colonel Fines, Mr. Aston, Mr. Swynton, Mr. Thelwall, Colonel Crompton, Mr. Scott, be added to the said Committee. The humble Petition of Edward Harper, on the Behalf of himself and many Families, Tenants of the late Dean and Chapter of Duresme, was this Day read. Resolved, That this Petition be committed. Resolved, That it be referred to the same Committee that the Lord Craven's Petition is referred unto, to hear the Business; and report the same, with their Opinion, to the House. The humble Petition of Katherine Stone Widow, and of Henry Stone her Son, was this Day read. Resolved, That this Petition be committed to the same Committee: And that the Purchasers be heard therein. Ordered, That Mr. Read be added to that Committee. The humble Petition of Wm. Earl of Salisbury was this Day read. Resolved, That it be referred to a Committee, to consider how the Five thousand Three hundred and Threescore Pounds Eighteen Shillings and Four-pence, due to the Earl of Salisbury, may be satisfied. Resolved, That the Committee to whom the former Petitions are referred, shall be the Committee to whom this Matter is referred, to consider according to the last Vote; and report the same to the House. Ordered, That it be referred to a Committee, to consider of the Abuses of Certiorari's and Hapeas Corpus; and of fit Remedies for Redress thereof: Viz. To Mr. Lechmere, Mr. Parker, Mr. Hoskins, Mr. Gewen, Mr. Long, Mr. * Lister, Mr. Yeo, Mr. Recorder, Sir Henry Vane, Sir John Whitterong, Colonel Clerk, Mr. Edm. Jones, Mr. Bulkley, Sir Richard Onslow, Lord Commissioner Widdrington, Mr. Bish, Sir Wm. Roberts, Colonel Birch, Mr. Goddard, Mr. Grove, Mr. Norden, Sir John Hobert, Mr. Minors, Mr. Gorges, Mr. Barnard, Mr. Shirley, Colonel Thomas Birch, Colonel Mackworth, Mr. Attorney General, Mr. Turnor, Mr. Serjeant Glyn, Baron Thorp, Colonel Rous, Mr. Warcup, Mr. Read, Mr. Thistlethwaite, Sir Gilbert Pickering, Mr. Foxwist, Sir Wm. Boteler, Mr. Heldesley, Lord Commissioner Whitelock, Mr. Wells, Colonel Chadwick, Colonel Ireland, Mr. Goddard, Mr. Fagge, Mr. Hay, Lord Commissioner Lisle, Sir Wm. Strickland, Sir Ralph Hare, Mr. Gibbs, Mr. Oxenden, Mr. Peckham, Sir Charles Wolsley, Mr. Sam. Disbrow, Mr. Holt, Mr. Smyth, Sir Anth. Ashley Cooper, Colonel Shettleworth, Mr. Shapcott, Mr. Cooper, Mr. Tho. Gorges: To meet in the Exchequer Chamber To-morrow in the Afternoon: With Power to consider of all the Abuses in the Law Courts; and present their Opinion to the House: And to send for Persons, Papers, and Records. Ordered, That Sir Gilbert Pickering (a Member of the House) have Leave to go into the Country. The humble Petition of Thomas Gewen Esquire was this Day read. Ordered, That this Petition be referred to the Committee to whom the Petition of the Lord Craven, is referred, to hear and examine the Business; and to report their Opinion therein to the House. Wm. Lenthall Esquire, Speaker of the Parliament, chosen to serve for the County of Oxford, and for the City of Gloucester, chooseth to serve for the County of Oxford, and waveth his Election for the City of Gloucester. Ordered, That a Warrant do issue forth, under Mr. Speaker's Hand, directed to the Clerk of the Commonwealth, to issue forth a new Writ, for electing of another Burgess to serve in this present Parliament, for the said City of Gloucester, in the Room of the said Wm. Lenthall, who waved his Election there. 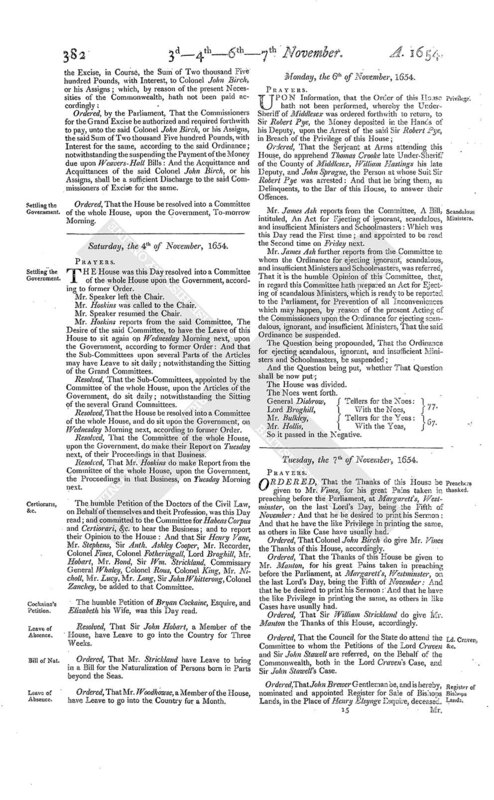 Ordered, by the Parliament, That the Commissioners for the Grand Excise be authorized and required forthwith to pay, unto the said Colonel John Birch, or his Assigns, the said Sum of Two thousand Five hundred Pounds, with Interest for the same, according to the said Ordinance; notwithstanding the suspending the Payment of the Money due upon Weavers-Hall Bills: And the Acquittance and Acquittances of the said Colonel John Birch, or his Assigns, shall be a sufficient Discharge to the said Commissioners of Excise for the same. Ordered, That the House be resolved into a Committee of the whole House, upon the Government, To-morrow Morning.